Ask the Dust is a somber movie about the search for the American dream during a time of poverty and racial intolerance in the City of Angels, by people who have been wounded either physically or emotionally, and try to move forward despite the restrictions placed on their lives because of their appearance and sir names. 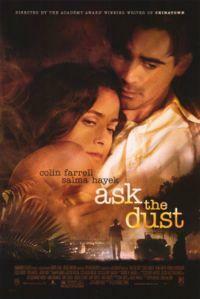 Arturo Bandini (Colin Farrell) is an Italian American who moves from Colorado to Los Angeles during the depression. A published writer who comes to L.A. with big plans to write a great story and marry a blonde Californian girl, Bandini's delusions of grandeur take a wrong turn as he suffers from writers block. He meets Camilla Lopez (Salma Hayek) a Mexican waitress who wants to marry an Anglo Saxon man so that her children can benefit from the advantages of having an American last name. Both go through a bumpy courtship as neither is willing to sacrifice their vision of who their potential partners should be. The affections of Vira Rifkin (Idina Menzel), a beautifully yet brutally scarred woman who finds a kinship with Bandini through his writing, helps him get over his insecurities and fall for Camilla. 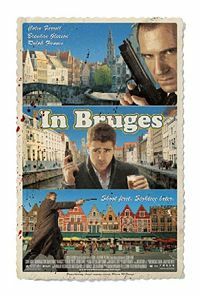 Colin Farrell continues to work with the right people and gives a good performance, as does Salma Hayek, who illuminates beauty, possessing a wild sensuality, yet also bringing forth a sense of class as well. The film’s best performance belongs to Broadway star Idina Menzel, who despite being on screen for a limited time, left a strong impression on this viewer. Robert Towne capture's the feeling of vintage Los Angeles unlike anyone else. 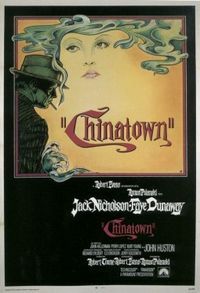 The beaches, sand storms, fog and earthquakes are all shown, and (much like his work in Chinatown) is written in meticulous detail and is filmed in the film noir style. Yet what lets it down in the end is the lack of emotional investment placed within the characters, with Towne and cinematographer Caleb Deschanel creating a pretty picture but forgetting to interject some life to it.